One of the major challenges in next-generation Internet is to allocate services to nodes in the network. This problem, known as the service placement problem, can be solved by layered graph approach. However, due to the existence of resource bottleneck, the requests are rejected from the beginning in the resource constrained network. 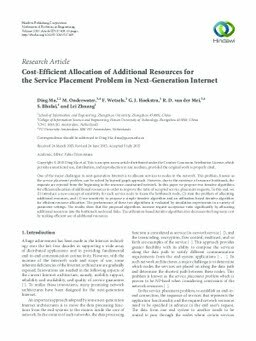 In this paper we propose two iterative algorithms for efficient allocation of additional resources in order to improve the ratio of accepted service placement requests. To this end, we (1) introduce a new concept of sensitivity for each service node to locate the bottleneck node, (2) state the problem of allocating additional resources, and (3) use sensitivity to propose a simple iterative algorithm and an utilization-based iterative algorithm for efficient resource allocation. The performance of these two algorithms is evaluated by simulation experiments in a variety of parameter settings. The results show that the proposed algorithms increase request acceptance ratio significantly by allocating additional resources into the bottleneck node and links. The utilization-based iterative algorithm also decreases the long-term cost by making efficient use of additional resources.